We here at the Fish have been following the fate of Auckland’s motorway obsession with interest. It seems that NZTA (the former Transit) and their Infrastructure Minister Stephen Joyce, are more than a little bit cautious when it comes to building things in tunnels. As many of our commenters here have noted, projected costs of $540 million per kilometre of tunnels are more than a little bit ridiculous. If you’re paying $540 million / km – you’re just not doing it right ! And so, while you were all out larging it on a Friday night, the Maximus massive were researching the interwebz, trawling through the factoids and the spamdroids to bring you facts and intelligent discussion on tunnels. Why? I hear you ask? Well, it just so strikes the Fish that one day Wellington could need to install a few more fast-going linkages throughout the city, and seeing as we are short of road space in certain points, it seems likely that we’ll need to go underground. Yes, it could be a tunnel for cars, or alternatively, we could start to think long term – what if we were to tunnel for a light rail system? So the principle is still the same for small ones as it is for big ones. The thing is, of course, that a TBM costs a lot to buy and to set up, as well as an ongoing cost per kilometre. Mind you, once it is set up, it would surely be simpler to just keep it going: ie a longer tunnel should presumably cost less per kilometre than a series of shorter, stop / start tunnels. So how much does it cost to buy one? We had difficulty finding prices advertised on the net – there is only one US maker (Robbins) and the rest are either Swiss / Austrian / German (ie Herrenknecht) or Japanese (ie Mitsuibishi). 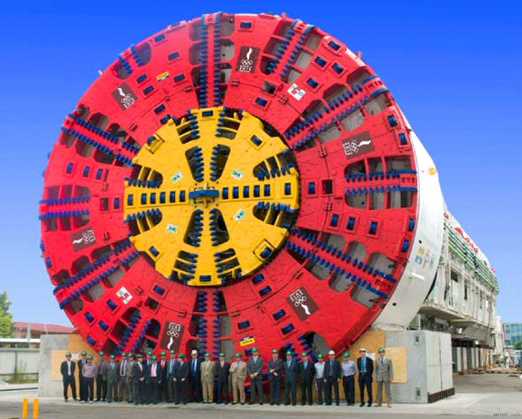 But there is a site where you can go to buy a used one : here and there’s even a newish Robbins TBM for sale there (main beam, open gripper, 9.8m diam shaft) for just a smidgen under US$ one million (normal cost about $10-20 million US$). For heavens sakes: there’s even one for sale on Ebay. If you want to know more about these beasts, here is a really good site all about the tunneling industry: The City of Ember Underground site. 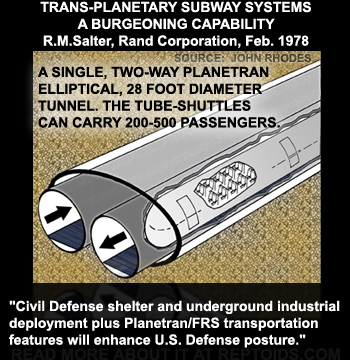 There are also many more sites that are just totally wacko – one alleging that the US has had nuclear powered tunneling machines that have been boring their way across America by using fusion to melt the rock into a smooth glassy opening, and others alleging that America is criss-crossed by these high speed tunnels in which travel trains traveling at over 14,000 miles/hr (thanks to jayseatee for that disturbingly fantastically weird link). I’m inclined to be a little sceptical of claims of nuclear-powered, rock-melting TBMs (called NTBMs or Subterrenes) as I’m sure that as with everything military, clever civilians would have got hold of it and be making money out of it (Teflon, stealth technology, even the Internet): and I’m not sure anyone would want to be traveling through tunnels bored with controlled nuclear explosions, due to the small matter of radiation… besides – our famed Nuclear Free stance would stop NZ from using that technology. The Norwegian tunnels were on a very long stretch – over 50km long; the Sydney tunnels are more similar to the NZ situation; while both the Boston and Tokyo costs are extortionate due to the extreme urban nature of the scheme. 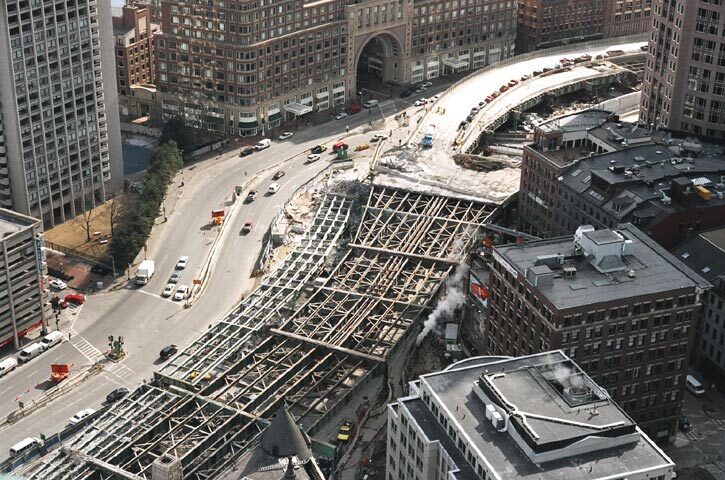 The picture below of the Boston “Big Dig” through city streets will give an indication of why that project had massive costs: building a multi-lane motorway about 5 stories below ground through a dense and historic city streetscape with massive underpinning, and spanning over existing underground metro lines – no wonder it was expensive. A 4 lane motorway ($540 million / km quoted) is therefore costing (in 2008 NZ$) some $135 million / lane / km. It seems just totally unlikely that in NZ, through basically virgin land in Auckland, that our tunneling costs should ever be as high as that. In Auckland, something just doesn’t add up. 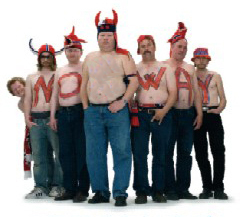 Only one thing does add up – Let’s call in the Norwegians to build tunnels in Wellington! I was planning to “large it” on Friday, but after consultation with various peeps a decision was made that there is a level of wind and rain above which it isn’t fun being in Courtenay Place at 2am on a Saturday morning. And that level is about one tenth of the amount we had on Friday morning. indeed: a good day for staying in and blogging. or, if you’re a kite surfer, going out and having a blast…. Isn’t there provision for another motorway ramp over the Clifton Tce car park? The columns there suggest such a thing. That might be planned to lane out to another Terrace Tunnel so we could have one for each direction? BTW, Welly is on shatterzone Greywacke which is quite hard but shot through with Argillite which weakens it a great deal. “Rotten Rock” which would need shoring up in any tunnel roof..
Don’t take the piss out of the Norwegians ! They just won the 54th Eurovision Song Conquest ! Norway won the 54th Eurovision Song Contest early on Sunday in Moscow, when singer Alexander Rybak beat 24 other contestants with his song Fairytale. Rybak scored a record 387 points, beating Iceland with 218 points and Azerbaijan with 207 points. It was the third time Norway has won the competition, one of the most watched television shows in Europe every year. “Now Norway is really on the map,” said an overjoyed Rybak at the post-tournament news conference…. Honeywood – I’ve always felt that the lonely garage at the top bend in Glenmore St – you know the one – set into the hillside, covered with moss… is really just a disguise, for a portal into another dimension. Perhaps that dimension is into the alternative reality, the parallel universe that is: Aro Valley. Makes sense really. And yes, you’re exactly right – the TBMs can go for miles and miles, and although bits gradually wear out, they just keep going till they reach the end. Bizarrrely it seems that despite the Used TBM site that we found (see main post above), in a lot of cases the hassle of pulling the machines apart and squeezing them out a hole at teh other end is sometimes too much, and they just leave them there. For instance (in researching this post I found out that) the Channel Tunnel machines started at each end (one in France, one in England) and met in the middle. And so they didn’t bash into each other, they just left one down there… drove it off into the rock at the side and concreted it over. So, somewhere in the middle of the English Channel, not very far down, there is a perfectly good used TBM, only 20km on the clock, one careful lady owner…. as is, where is condition. Erentz – “Speaking of Boston�s extraordinary big dig: $10 billion and all its done is move congestion elsewhere apparently. ” Well, the congestion has gone elsewhere, and now the Bostonians can cross a gentle boulevard and walk to the edge of the sea. Wouldn’t that be nice? Sounds like something it would be nice to do here too, if only we had a few billion more dollars to spend. I think the point to note is that it shows that: If you Plan a road Properly FIRST TIME, you don’t have to come back later and spend billions redoing it later. Transit – are you listening? Good post re tunneling – that reminds me – when they were building the Jubilee Line Extension in London, the PR people held a competition amongst the local school children to name the TBMs. The children from the posh area called theirs “St James the Giant Cruncher Muncher Machine” – although it was too much of a mouthful and the tunnelers just called it TBM 2. But the children in the East End called their two “Sharon” and “Tracey” – which were much shorter, and stuck – everyone called them that. The kids said they named them that because “they were really boring, but they’d go all the way”…. Just found this website so I may be a little out of date with the rest of you. I left high school (UHC) in 1968 – my 1st job was in Adelaide Rd just past the Basin. Even back then the traffic was rather congested eg sometimes it was quicker to RUN after work down to Courtney Place to catch a bus to the Railway Station. My only query would be how is this machine dis-assembled and transported?